Soul Brother Speaks | | Welcome to the land of the REAL. Unique observations of life. The easiest way to understand communication is to look at the process of communicating. Because the process is continuous and ongoing, it is impossible to capture the process of communication in a single diagram or model. By recognizing communication’s limitations, a model or diagram of the process of communication can be constructed. This diagram will show how the various elements work together to make communication happen. The diagram is a means of becoming more critically aware of the complexity of human communication. The sender packages this thought, idea, or request in the form of a message. The message is only the vehicle for two-way communication. Standing alone, it has no meaning. It is the meaning that the sender intends to send, whether consciously or unconsciously, and the meaning the receiver assigns to it that gives the message any real significance. The meaning the sender assigns to the message often has a different meaning than the receiver who assigns meaning to the message. This discrepancy between the sender’s intent and the receiver’s interpretation is the source of many communication breakdowns. Messages can be transmitted verbally or nonverbally. Verbal transmission is by speaking-the words that convey a message. It is considered a conscious act since the sender is normally aware of what is being said. The impact of the real words has little influence on the overall meaning of the message as the receiver interprets it. Senders often make an incorrect assumption that what is said stands on its words alone. After all, how often is the expression, “That’s not what I said!” heard? Based on how the sender said it, the words chosen and the body language used-all these things add up to the message the receiver interpreted. The message is the message received. What the receiver hears is more important than what the sender meant to say. It does not really matter what the sender had in mind; the receiver is not responding to what the sender meant to say, the receiver is responding to his/her interpretation of what the sender said. Nonverbal messages make up a large percentage of the meaning. Those things affecting the verbal message such as tone of voice used, the rate of speech and the pitch are all examples of nonverbal messages. The example, “I said I am all right” seems unemotional, right? Maybe not. If the sender said, “I said I am all right” by slowing down the rate, by saying it in a high-pitched voice, with an overall angry or short tone of voice and by emphasizing “said” and “right”, it would give the same message a completely different message. It now may be making the statement, “Stop worrying about me and leave me alone to do my job!” The second is a different message from the first and will ask for a different response from the receiver than the first message. How the sender chooses to communicate through body language influences the meaning of the message. Facial expressions such as smiling or frowning influences the message. Body language such as crossing the arms across the chest affects the meaning of the message. Whether the sender stands up straight or slouches indicates to the receiver what is really meant by the message. Whether the sender looks straight into the receiver’s eyes or looks away effects the meaning of the message. The dress, the environment, even doing or saying nothing at all sends a message to the receiver. Unlike verbal messages, nonverbal messages are often unconscious. The sender may be very careful in dressing a certain way and choosing a certain setting or environment to communicate with the receiver. However, factors that the sender may be completely unaware of, such as posture or eye contact, can greatly alter the receiver’s interpretation of the sender’s intent, so that the receiver “reads” a completely different message. The sender’s unconscious behavior can reinforce or completely undermine the purpose or intent. If the sender’s nonverbal behavior is consistent with the message, the chances are better that the receiver will understand the meaning of the message as the sender has intended to communicate it. On the other hand, if the nonverbal message contradicts the verbal message, the receiver will respond to the nonverbal message instead of the verbal message. Roughly only 7% of the impact of the message is determined by the sender’s actual words. The tone of the message accounts for about 38% of the impact of the message and body language accounts for about 55% of the impact of the message. If a verbal message with a weight of 7% contradicts a nonverbal message accounting for the remaining 93%, the receiver will assign meaning to the message based on the nonverbal message instead of the verbal message. This is why the sender must be aware of the impact of nonverbal communication. It is almost impossible for the sender to be aware of every nonverbal message being sent at any given moment while trying to figure out and communicate what to say, at least being aware of the nonverbal behavior will help the sender avoid many misunderstandings. It’s also a good idea for the sender to check with the receiver to make sure both are assigning the same meaning to the message. It’s almost a certainty that if the verbal and nonverbal messages contradict each other the receiver is going to be confused and will rely on the nonverbal message. 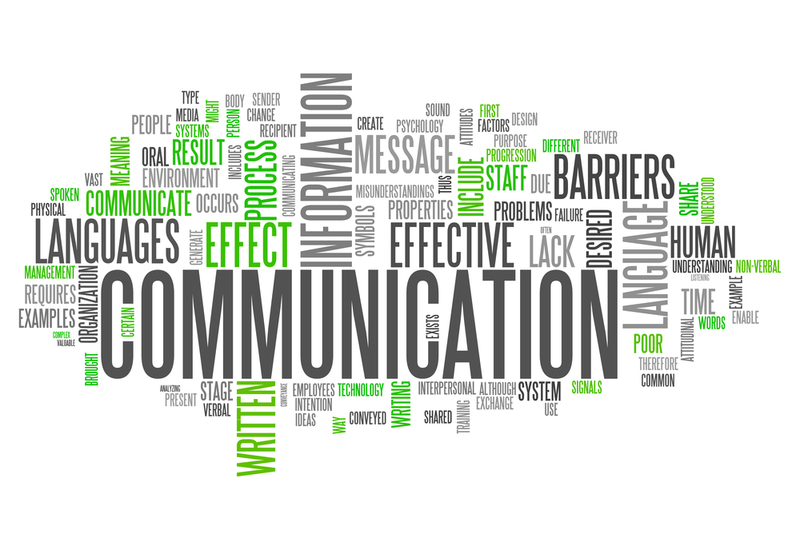 The meaning of the message influences the success or failure of the communication. The sender has some purpose or intent in mind when communicating the message. It has also been emphasized that the breakdown in communication comes when the receiver assigns a different meaning to the message than what the sender intended and that can result in conflicting information that the receiver interprets in the form of nonverbal communication. It is the receiver who assigns meaning to the message, either on a conscious or subconscious level. Again, the message is the message received. The receiver will be responding to the interpretation of what the sender has “said.” How the receiver interpreted the message and the meaning assigned to it, is now the message. Whatever purpose or intent the sender had in mind is now irrelevant. From this moment forward, how the receiver responds will shape future responses. Understanding that message is the message received is the key to successful two-way communication. Finally, the feedback loop is the receiver’s response to the interpretation of the sender’s original message. The feedback may be verbal or nonverbal. It may be conscious or unconscious. It is now the sender’s turn to interpret what the meaning of the receiver’s message is. This is a dynamic process. It is ongoing, continuous, and simultaneous all at once. This is the essence of the two-way communication process, it is easy to understand why breakdowns happen. Two-way communication is continuous because normal communications rarely consist of a single message being conveyed. The sender transmits a message and the receiver interprets it. Then the receiver responds back and the process is repeated. Even the sender is speaking to the receiver, the receiver is giving feedback to the sender. The receiver may be communicating with the sender verbally or nonverbally by smiling, yawning, moving closer, etc. Since information is being transmitted by a sender to a receiver and because feedback transmits information back to the sender (about the impact of the message), communication is a continuous, ongoing process. Two-way communication is simultaneous not only because one person often begins to speak without letting the other person finish, but also because two or more independent conversations may be going on at the same time. In an interaction between two people, the sending, receiving, and feedback activities are going on at the same time with the roles of the sender and receiver alternating. While speaking, the sender is aware of the receiver’s feedback, who becomes a sender simply by providing that feedback. When the sender makes adjustments in the message because of the feedback from the receiver, the sender is also providing the receiver with feedback to that message. Feedback requires a continual adjustment for both the sender and the receiver. If what the sender says to someone is not getting through (as indicated by the receiver’s verbal and/or nonverbal response), the sender can change or adjust the message in such a way as to make it clear to the receiver. Effective communication depends on both parties sharing the roles (and responsibilities) of sender and receiver. Because misunderstandings are likely, both the sender and the receiver should keep up a flexible attitude and approach. Most of us spend more time listening than any other communication skill yet it is the communication skill that can be the least developed. The importance of developing listening skills should never be underestimated. Listening is often confused with “hearing.” Hearing is passive listening where the information is only absorbed. It requires minimal energy to passively listen. Active listening, however, requires the receiver to focus full attention to the message being received. The receiver has to make sense of the message by hearing, interpreting, and storing the message. The message is fed through the receiver’s perceptual filters where the new information is coded and stored based on the receiver’s past experience, value systems, beliefs, etc. The receiver must be actively aware of the sender’s message, both verbal and nonverbal. This means listening to and dealing with the sender’s feelings and emotions. These feelings and emotions appear in nonverbal form. Since 93% of the message’s meaning is determined by the sender’s tone and body language, its essential the receiver listen to and acknowledge these nonverbal cues. Without the nonverbal cues, complete understanding of the sender’s message is nearly impossible. The receiver needs to be paying attention to the sender’s verbal and nonverbal messages. Also, the receiver must also be aware of how they are assigning meaning to the message. This is not an easy task because it requires a high level of self-awareness. Through the receiver’s communication patterns in the past, the receiver probably has become aware of how he/she processes information as an individual. Based on these past patterns, the receiver can respond appropriately by asking questions, taking notes, or other means. One reason why breakdowns in communication happens is the rate at which we process information. Our brain is capable of handling a rate of speech about four times the speed of the average speaker. The average rate of speech is roughly 125 words per minute and the average rate of comprehension is 400-800 words per minute. (Comprehension is hearing and understanding the message. Processing is beginning to assign meaning to the message and associating it with other information.) Subsequently, that can leave lots of time for a mind to wander while listening. During these times the receiver is drifting-thinking about things to do, places to go, other conversations had, etc. The mind cannot be fed information fast enough to keep it busy, so it begins to look somewhere else for stimulation. As a result, the receiver tunes out the sender and begins to focus on the other things. Whew we are faced with idle brain time, active listeners summarize and integrate what has just been said. New information is put into the context of what came before it. The active listener concentrates intensely on what the sender is saying and tunes out thousands of random thoughts (vacations, getting the car fixed, lunch, etc.) that create distractions. The listener may completely miss what the person is saying because of a physiological or psychological distraction.This may happen because the listener has a head cold that effects the hearing or because the listener is preoccupied with the head cold, or maybe the receiver has just had a disagreement with another person. The listener may have heard what is said, but is unable to understand it.If someone speaks with a thick accent or in a different language, the receiver might be unable to understand what is being said. If the sender describes things using words that the receiver may not understand, the receiver may not be able to understand the message the sender is trying to send. The listener may hear what is said, but may assign a different meaning from what the sender intended.“The store is not far” can be interpreted to mean different things to different people. The reality is this happens all the time. This is where the receiver’s individual perceptions are products of past experiences, beliefs, values, etc. and affect the receiver’s interpretation of the message. The receiver listens accurately, but as time passes the receiver’s mind may change the meaning.This also happens often and usually the result of the mind looking for a pattern or a way to link new bits of information with existing information. The receiver listens accurately, but then forgets the new piece of information.This can be linked to what we discussed above. The mind’s ability to link information with a different piece of information already stored. Maybe the receiver was preoccupied with something else when the information was initially communicated and unconsciously the decision was made that the information was not important. Pence may shore up support among white conservatives, particularly evangelical Christians wary of Trump, but Trump’s running mate may not easily connect with non-white voters, and many of the elected Republicans who could play that role aren’t Trump allies. On July 17, in the second (at least) targeted attack on police in just over a week, 29-year-old Gavin Long shot six cops, three fatally, in Baton Rouge, Louisiana. The former Marine had posted YouTube selfie videos in which he commented on the need to respond to “oppression” with “bloodshed,” and praised the recent shooting of 11 officers in Dallas as “justice.” Long also appears to have been part of the so-called “sovereign citizen” movement. Last May, he filed official documents in Jackson County, Missouri, declaring a name change and identifying himself as a member of the Empire Washita de Dugdahmoundyah—a black group that espouses some of the movement’s ideas. According to the Daily Beast, Long was also carrying an ID card from the Empire at the time of the shooting. Here’s what you need to know about sovereign citizenship, and the branch Long subscribed to. Sovereign citizen ideology is modeled on Posse Comitatus. A government-hating, right-wing Christian group, Posse Comitatus was founded around 1970 in Oregon. Its members claimed that white Americans, not Jews—whom members accused of manipulating government and financial institutions—were the true descendants of the Biblical tribe of Israel. Posse members rejected the authority of government officials, judges, and police officers. They claimed that because blacks were granted citizenship under the 14th Amendment (an act of government) they were bound by the government’s laws and were slaves to the state. But white citizenship predates the Constitution, the Posse claimed, so whites were bound only by “common” law, which made them “sovereign” and free—and not, for example, compelled to pay taxes. Anyone who’s ever rented in New York City knows how hard it is to get reliable information about an apartment. How much has the unit rented for in the past? Does the building’s history entitle tenants to rent-regulated leases? If so, for how long? These are important questions that every renter should be able to answer before they sign a lease. Except that there’s no one place to find the information. But there could be. And, in fact, according to New York law, for many apartments, there should be. Since 2007, there’s been a statute on the books that requires the city’s Department of Housing Preservation and Development to collect and make public key data on the thousands of new apartments built each year under the city’s single-biggest housing subsidy. But the provision has been ignored by HPD: The agency simply hasn’t done it. The requirement is part of section 421-a of New York’s property tax law — the legislation that can slash landlords’ tax bills by upwards of 90 percent. In exchange, owners of the estimated 83,000 city apartments covered by the tax break must agree to limit rent increases on all their tenants and set aside a portion of the units for “affordable” below-market rents in certain high-priced city neighborhoods. The housing department’s decision to ignore the law’s reporting requirement has deprived New Yorkers of vital information on the apartment buildings that benefit from the subsidy, which costs taxpayers $1.2 billion a year in lost revenues. Soaring inequality in America has been accompanied by a plummet in upward mobility since the early 1980s, with those who earn modest incomes in their first jobs likely to remain trapped in low-wage work for decades, a troubling paper concludes. Published in May by economists Michael D. Carr and Emily E. Wiemers, who hail from the University of Massachusetts in Boston, the study is based on data from the Census Bureau’s Survey of Income and Program Participation and examines the years 1981 to 2008. The paper, published by the Washington Center for Economic Growth, concludes that this decline is particularly pronounced for the so-called middle class. After Gavin Long’s attack on officers in Baton Rouge, Police Chief Carl Dabadie observed that police “are up against a force that is not playing by the rules.” I understand and share his anguish for the loss of life, but I could not help being struck by his choice of words. To what force was he alluding? On Meet the Press following the Dallas killings, former New York mayor Rudy Giuliani laid the blame squarely at the feet of Black Lives Matter. On CNN Tuesday morning, Wisconsin representative and former reality-TV star Sean Duffy went a step further and suggested greater scrutiny of the Black Lives Matter movement, which he argued is a prime instigator of violence against police. All of this rhetoric is part of a rising chorus after the Texas and Louisiana killings, an effort to define a new category in the war on extremism—so-called black-nationalist terrorism. Proponents struggle to manufacture a domestic equivalent for Al Qaeda. Efforts to link the violence against law enforcement to some mythical, larger black separatist movement, which has made retaliatory violence against police one of its chief aims, is weak at best and irresponsible at worst. The Republican National Convention nonetheless built much of its opening night on Monday around this idea, with its theme of “Make America Safe Again.” Giuliani impliedthat the Black Lives Matter movement has “targeted” police and put a target on their backs.” Milwaukee County Sheriff David Clarke was offered as a black law-enforcement spokesperson supporting the notion that the movement represents dangerous extremism. To be clear: The black lives movement unapologetically focuses on the dignity and worth of black lives. The careless and dishonest way Duffy, Giuliani, Clarke and others chose to frame that movement creates a context that shifts attention away from the very police practices that nonviolent protesters are demonstrating against. More significantly, the possibility of legislators addressing the actions of two mass murders by doubling down on nonviolent protesters may exacerbate an already tense situation, put into place more oppressive polices and procedures, and inflame police-community relations. Almost eight years after Barack Obama’s election as the nation’s first black president –an event that engendered a sense of optimism among many Americans about the future of race relations1 – a series of flashpoints around the U.S. has exposed deep racial divides and reignited a national conversation about race. A new Pew Research Center survey finds profound differences between black and white adults in their views on racial discrimination, barriers to black progress and the prospects for change. Blacks, far more than whites, say black people are treated unfairly across different realms of life, from dealing with the police to applying for a loan or mortgage. And, for many blacks, racial equality remains an elusive goal. St. Petersburg police Chief Tony Holloway lost friends when he became a cop. He knows some people hate him for being one. As a national race and policing debate swells, Holloway and other black officers find themselves in a thorny middle ground between a fiercely loyal law enforcement community and some minorities that do not trust authorities. The difficult position was highlighted by a recent Facebook post from Baton Rouge police Officer Montrell Jackson. On July 8, after an ambush killed five officers in Dallas, Jackson wrote that he loved his Louisiana city but wasn’t sure it loved him back. He was shot to death Sunday with two other cops. Some officers in the Tampa Bay area routinely face the tension of such a dual existence. “I think in general, because of the position we hold, we’re not going to always make people happy,” said Hillsborough sheriff’s Deputy Monique Greco. Greco, a Tampa native, has been a sheriff’s deputy for 16 years. Part of what attracted her to the job, she said, was a desire to bring change from within the ranks of police. Growing up in Town ‘N Country, she knew male family members who had negative encounters with cops. The bank’s CEO and president, Cynthia N. Day, thanked Killer Mike on Twitter for urging people to collectively put $100 million in Atlanta’s only black bank just days before the increase in business.